HubSpot is an easy-to-use system, but most people only set it up once. This process can be time-consuming for people who haven’t done it before. After setting up HubSpot for dozens of customers, we’re experts at getting it up and running quickly. We start with day one activities— a set of things we get set immediately so you can start getting data into the system and capturing value immediately. Then we run through an 80+ point setup process to ensure that everything is set up for your company’s unique preferences. Working with a certified agency partner gives you some key advantages. 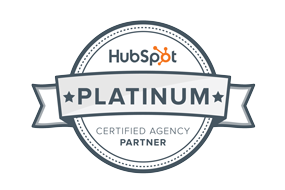 First, you can get your HubSpot Onboarding requirement waived. Second, instead of just support on setting things up, we’ll actually provide all of the set up, and can begin working with your team on best practices for set up. People who are about to purchase HubSpot or are considering it. (Please note: we cannot help you waive your onboarding costs after you have already signed up). A HubSpot agency partner can work more closely with you to understand your growth goals and get everything set up to align with those. If you’re considering HubSpot, contact us about how we can develop an onboarding plan that’s customized to your goals. We’ll help you determine priorities and hit the ground running as soon as your contract is finalized. Standard onboarding can be done in three weeks. We’re experts at HubSpot. Over the years of working with the platform, we have developed a detailed process that allows us to move quickly at this and ensure nothing is overlooked.